A solar wind stream flowing from the indicated coronal hole should reach Earth on Feb. 25-26. Credit: SDO/AIA. WEAK IMPACT: A CME hit Earth's magnetic field on Feb. 26th at ~2100 UT. The impact was weak and does not appear set to cause a strong geomagnetic storm. LOOK WEST AT SUNSET: Venus, Jupiter and the crescent Moon are beaming through the evening twilight, forming a bright triangle visible through city lights and even thin clouds. Try to catch them before the sky fades completely black. The trio surrounded by twilight blue is an especially beautiful sight. This is such a nice event, NASA has issued a news release and video about it. Sky maps: Feb. 25, Feb. 26. 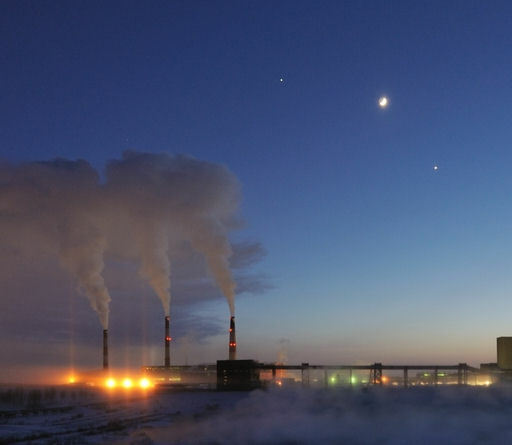 "Even the industrial landscape looked beautiful with the planets shining above," says Kantsurov. The cloud's impact could spark a G2-class geomagnetic storm, so high latitude sky watchers should be alert for auroras. Aurora alerts: text, voice. 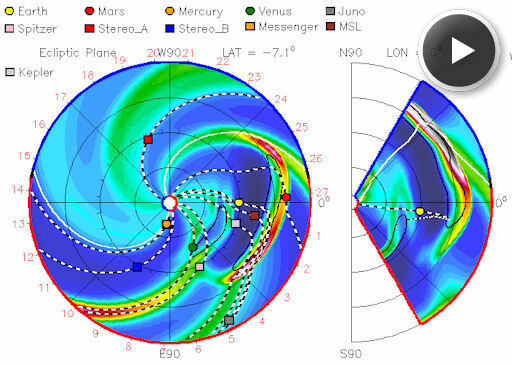 If the forecast is correct, the CME could also hit NASA's Mars rover Curiosity on Feb. 27th. The rover, en route to the red planet onboard the Mars Science Lab spacecraft, is equipped with a radiation sensor that could detect energetic particles accelerated by the CME's passage. Indeed, this has happened before. The CME was hurled into space by a filament of magnetism, which rose up from the sun's northestern limb and erupted on Feb. 24th: SDO movie. Although much of the cloud headed north, out of the plane of the planets, the cloud's lower edge will dip down low enough to intersect Earth, Curiosity, and Mars. Even among veteran observers, it is always a bit of a surprise to see Venus pop out of the blue sky when you look straight at the planet. 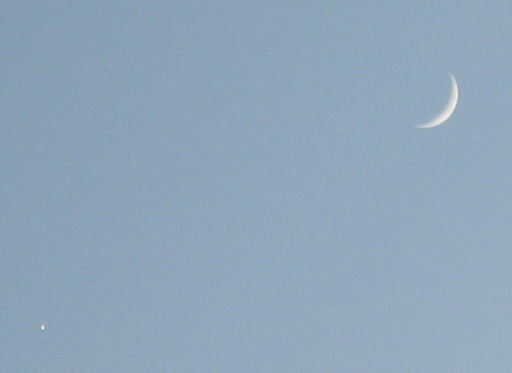 Many observers had this experience on Feb. 25th as the helpful Moon glided only 3o away from the goddess of love. On February 26, 2012 there were 1287 potentially hazardous asteroids.